Thousands march from Garfield High to keep alive MLK’s fight for economic, racial justice — and a $15 minimum wage? Thousands of people marched through Seattle to Westlake Park Monday to keep alive Martin Luther King, Jr.’s fight for economic justice and a higher minimum wage. 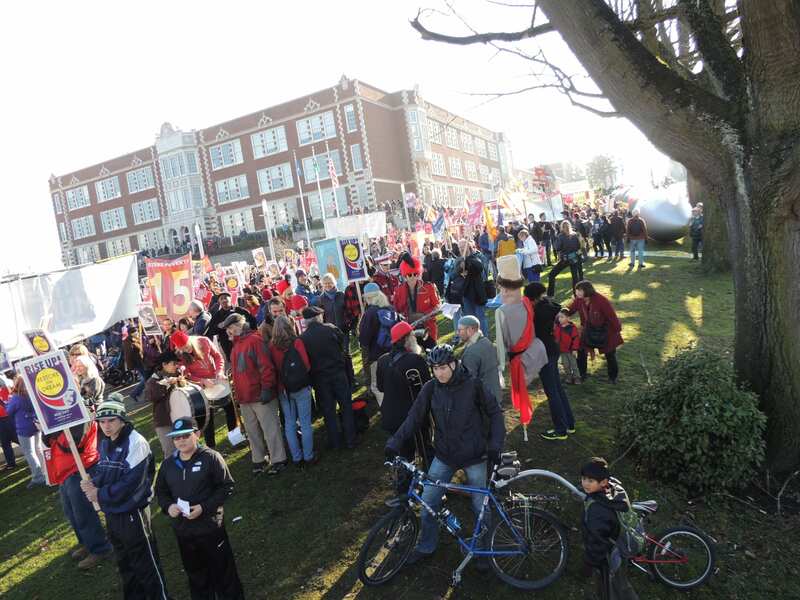 The MLK Day Rally and March began in the Central District with a gathering inside Garfield High School. 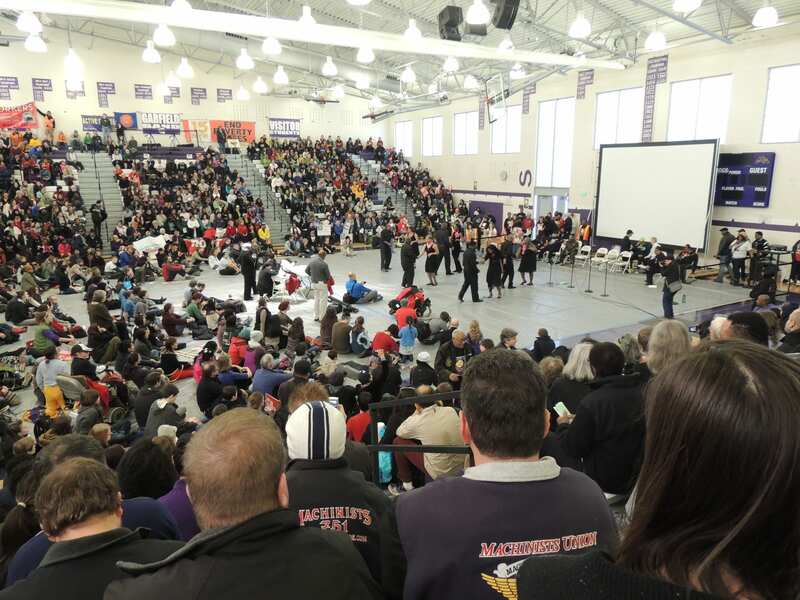 Hundreds of people packed into school’s gymnasium to hear speeches, watch performances, and honor the event’s longtime organizer, King County Council member Larry Gossett. Monday marked the 32nd annual celebration of MLK Day in Seattle. Newly elected City Council member Kshama Sawant attended the rally and march. She’s been at the forefront of Seattle’s $15 an hour minimum wage fight and said that struggle honors King’s memory. Prior to his assassination April 4, 1968 King was a strong advocate for raising the minimum wage to $2 an hour — that calculates to just over $15 today when adjusted for inflation. 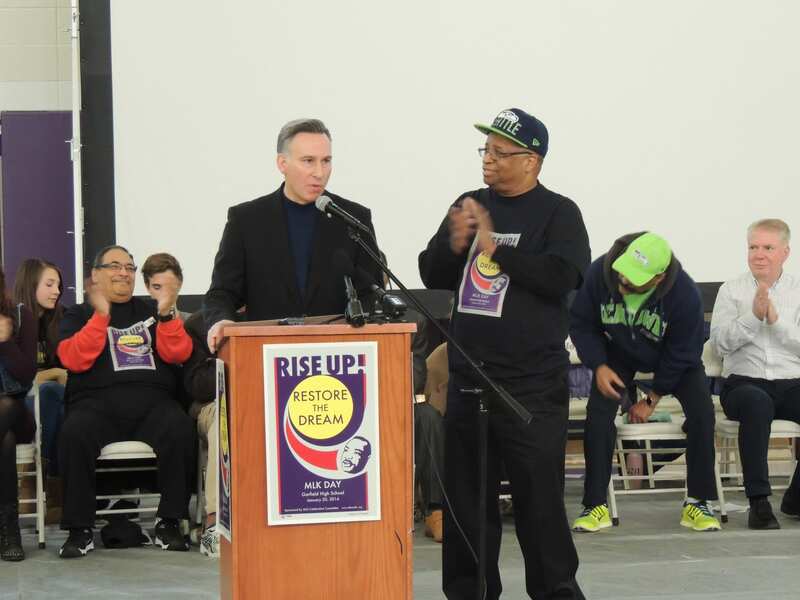 Mayor Ed Murray and King County Executive Dow Constantine were also in attendance. Murray thanked Gossett for being an early supporter of marriage equality and for spearheading the effort to change King County’s namesake to MLK in 1986. Previously King County was named after one of the state’s nation’s early civic leaders who was also a slave owner. Former head of the Black Panther Party’s Seattle chapter Aaron Dixon delivered the rally’s keynote address inside Garfield High. The march attracted thousands of participants and onlookers along central Seattle streets but was a peaceful and mostly calm event even as nearby East Precinct at 12th and Pine was readied for possible protest activity that has accompanied past social justice rallies in the area. The march and rally wrap a weeklong string of events in central Seattle to honor MLK. This entry was posted in News, etc. and tagged garfield by Bryan Cohen. Bookmark the permalink. “Previously King County was named after one of the state’s early civic leaders who was also a slave owner.” That would be Vice-President William Rufus King who never (best as I can tell) visited Washington. He was inaugurated in Cuba (! ), lasted about 6 weeks in office (TB), and is widely believed to have been gay and involved with (not yet) President James Buchanan. King and Buchanan had planned to run for vice-President and President together. While it would be nice to ensure a base quality of life, I’m not sure Sawant, etal are thinking things our very well. How much do you make an hour? $15.01 or more perhaps?